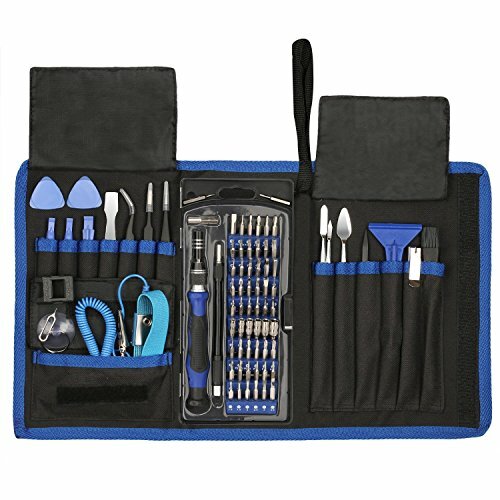 The new Pro Tech Toolkit is the one thing every DIYer, fixer, hacker, hobbyist, and professional needs to tackle any job. 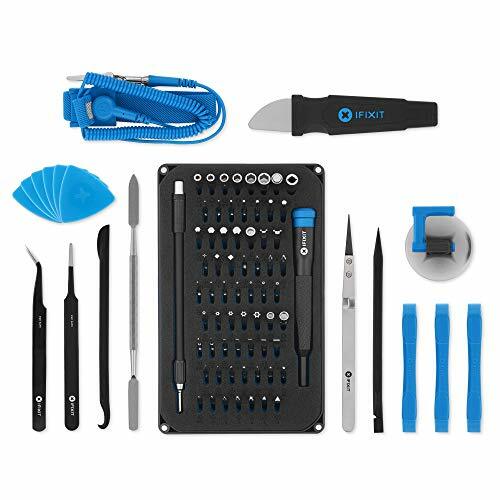 Need to open up and repair your iPhone 4/ 4S/ 5/ 6/ 6 Plus in any way, shape, or form, then this complete, premium DIY iPhone Repair Tool Kit is right for you! Note: This set of iphone repair tool can open cases (the bottom)of iPhone X, iPhone 7/7 plus and iPhone 8/8 plus only, but cannot unscrew their metal plates inside. Package Includes: 1 Premium Pentalobe Screwdriver (1.2 x 30mm) 1 Premium Pentalobe Screwdriver (0.8 x 30mm) 1 Premium Philips Head Screwdriver (1.2 x 30mm) 1 Premium Flat Head Screwdriver 1 Premium Nylon Spudger 1 Set of Replacement Adhesive 1 SIM Card Tray Opener 1 Suction Cup 2 Pry Tools Repair Open 1 Triangle Paddle 1 Ultrafine Microfiber Cleaning Cloth! Warranty: 18-month warranty. For any question, please feel free to contact us. We will get back to you within 24 hours. NOTE: Because of the product update, the plastic pry tools, Plastic triangle pry tools in the products you receive may be blue, will not affect the use, Please understand if there is any inconvenience. T6/T8/T10 is used to open the Xbox controller, and cross screwdriver 1.5 is used to open the PS3/PS4 controller and other electronics. The professional screwdriver set for Xbox will protect your controller and nails, making your repair and cleaning work easier. It's really handy kit with an exquisite EVA storage bag, which facilitates removal and storage of tools, avoids the loss of tools and is easy to carry. The flexible caps, at the bottom of Xbox screwdrivers' handles, rotate smoothly that make the maintenance job effective. Package included: 1 * T6 x 50mm(screwdriver head with a middle hole) 1 * T8 x 50mm(screwdriver head with a middle hole) 1 * T10 x 50mm(screwdriver head with a middle hole) 1 * Cross 1.5 x 50mm 1 * Premium Metal Double Headed Crowbar 2 * Plastic pry tools 2 * Plastic triangle pry tools 1 * Wooden handle brush 1 * Ultrafine microfiber cleaning cloth 1 * Exquisite EVA storage bag Warranty: 18-month warranty. For any question, please feel free to contact us. We will get back to you within 24 hours. High Quality & Well Perform : These durable screwdriver bits are made of CRV steel, whose hardness can reach to HRC52-56, you can use it for long time. The non-slip driver in the market is machined from a single piece of aluminum, and cover with the Silica gel, it also with a ball bearing mounted swivel top. Special Bits For iPhone 7/ 7 Plus : This updated advanced screwdriver set includes new bits (Y size 0.8 and Mainboard size 1.5) for iPhone 7/iPhone 7 Plus. Ergonomic Design : The unique driver is skid proof as well as anti static, which makes it be held more easily and safer for a long time. Durable Portable Nylon Bag : Professional portable hardware tools with perfect weight & compact design for easy carry. The tools in the bag made of durable nylon will be carried home and out for various uses easily. P2 0.8mm PL1 Pentalobe Screwdriver Fits the 5-point pentalobe screws found on the bottom of iphone 4s 5, 5s, 5c , se, 6, 6 plus, 6s , 6s plus, iPhone 7, iphone 7 plus. P6 1.5mm PL5 Pentalobe Screwdriver you can Used to remove 5-pointed "Pentalobe" screws on the mid 2009 MacBook Pro 15" Unibody's battery. This may not include every screwdriver you'll need for macbook repair, it only have 3pcs pentalobe screwdrivers. It does not include: Phillips, Tri-Wing Tri-Point (Y) or Torx. 1. Fits pentalobe style fasteners used in Apple brand products, use high performance CRV premium tool steel. P6 1.5mm PL5 Pentalobe Screwdriver you can Used to remove 5-pointed Pentalobe screws on the mid 2009 MacBook Pro 15 Unibody's battery. 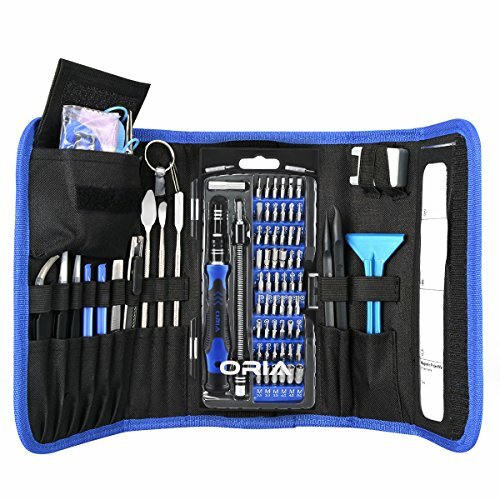 Zacro 21 pieces pry tool repair kit is designed for cellphone. Taking apart your mobile devices without damage to the tablet or phone cover and remove the small cables in cell phones. Each gadget has its own unique function. 1 x ultrafine microfiber cleaning cloth. Every Zacro product includes 18-month warranty. Please buy with confidence. No more "can you help me to fix my phone, I dropped it and broke the screen." 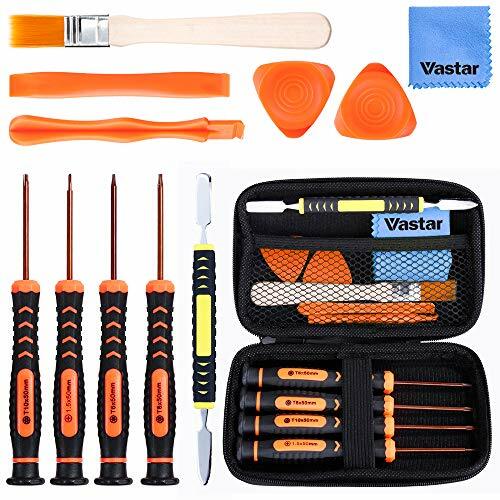 Fix your own devices by yourself to enjoy the DIY repair joy with our fairly complete Repair Tool Kit Precision Screwdriver Set now. 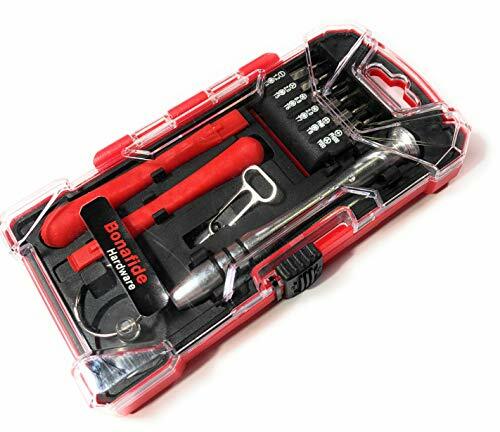 1.100% New Precision Screwdriver Repair Tool Kit Set with premium quality./ 2.Avoid leaking personal privacy. 3.Meet different repair needs./ 4.Suitable for most electronic devices. 5x Torx Screwdriver-T3,T4,T5,T6,T8:Computer/PC/Laptop/Notebook, Mobile Phone, Tablet PCs, Hard Drives, Xbox, Game Handles, Razors, Macbook and other small appliances. 2x Star Screwdriver-0.8, 1.2:Disassemble APPLE products,such as iphone,ipad,ipod,macbook and more. 2x hillips Screwdriver-1.2,1.5:Widely use to disassembe most of household appliances. 1x Slotted Screwdriver-2.0:Widely se to disassembe most of household appliances. 1x Y-tip size-0.6:Disassemble iPhone 7 and 7 Plus. 1x Black Plastic Pry Tool:Great for separating phones' or pads' screens like touch screens and glass screens. 1x Green Plastic Seperate Tool:Great for poking and prying small components,opening ZIF connectors, and soldering applications. 1x Metal Pry Stick:Great for prying the tricky enclosures. 1x Metal Pry Shovel Tool:Pry phone or shovel tin point. 2x Triangle Paddle:Great for prying the tricky enclosures. 1x LCD Suction Cup:Great for seperating and removing screens. 1x ESD Bent Tweezer:Great for handling small wires,mini screws,and reaching where your fingers can't do. 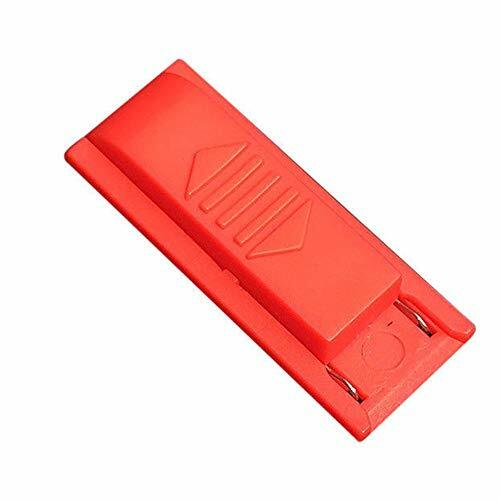 1x SIM Card Ejector Pin:Easily open/ remove/ eject the SIM card tray..
SUPPLY for you : GangZhiBao 21-pcs repair tools kits Set for Most Electronics Devices at home&work with Lifetime WARRANTY and great 7/24 customer service. 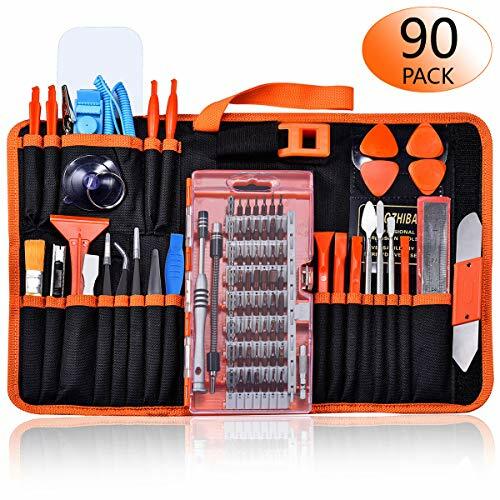 SAFETY for your personal equipments : fix by yourself with this professional-grade repair kits to protect privacy from strangers; you needn't to ask help from friends or wait for repairing technician or look for a repair center. This electronics repair tools kits can not only save your money and time but protects your personal privacy! High-quality Handy MATERIAL : Magnetic durable stainless steel tip which is is stable and not easy to stripping and deforming; Plastic handle with rubberized grip; Anti-static ESD tweezers with strong corrosion resistance are used, the tip is not easy to strip and deform. 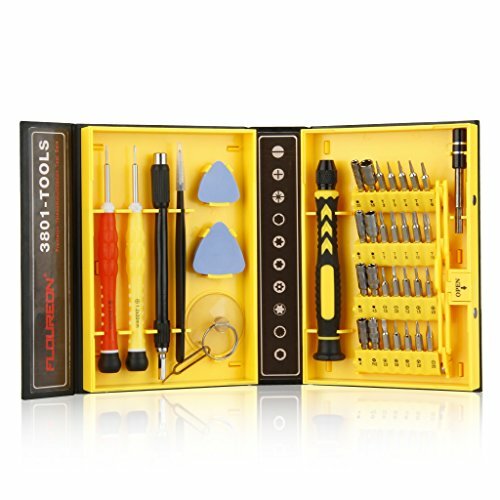 You will found that it's so high performance after compared with ifixit tool kit. 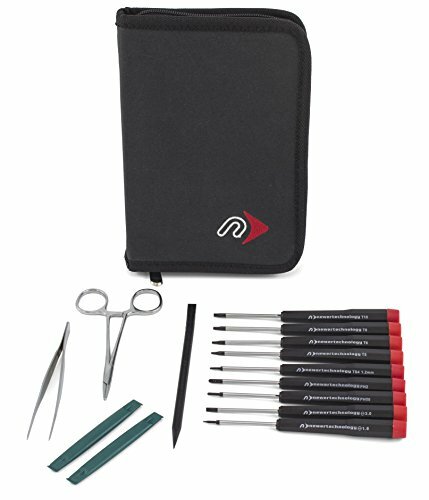 MULTIFUNCTION : disassembly, pry opening, take apart phone, tablet, computer to replace screen, battery or camera lens, clean the dirt inside with electronics tool set; Portable and fit in pocket/backpack - great for home, office, school, business trip, travel. 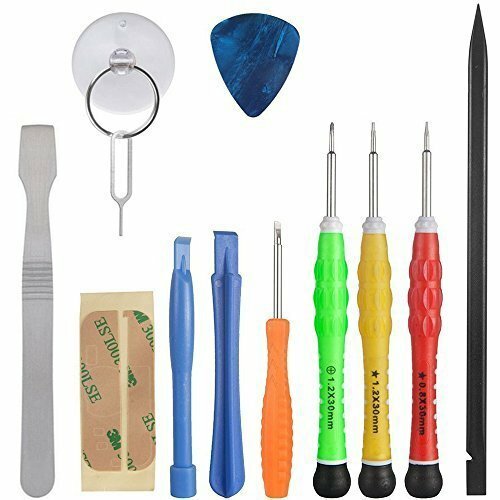 MULTIPURPOSE : repair kit set for different digital products, such as Mobile Phones (iPhone6/6s/7/7plus, Samsung, LG, HUAWEI, Google, HTC), Computer, PC, laptop, desktop (HP, ASUS, Lenovo, Apple Macbook), Table, iPad, SLR cameras, Game Console (PS4, Xbox, Nintendo), game handle/joystick and other electronic devices. A Great GIFT for IT technician, technical engineer, hacker, electronics enthusiast, fixer, hobbyist, DIYer, student, housewife, ect. a long time, this tools kit fits into the devices around our daily life both home and work. 1 100% New precision screwdriver repair tool kit with excellent quality. 2 Protect personal privacy and property. 4 Multi-function: Meet different fix needs. 5 Practicality: Suitable for most electronic digital products/home appliances. 6 Portable: 2 iPhone 6s size allows you to easily carry. Customer First Customer satisfaction is our TOP Priority. If you don't like it or it has any issues with the quality or type, you can return it within 30 days. And we provide you the warranty of lifetime to this item, please don't hesitate to contact us if you have any questions, we will try our best to solve your problem within 12 hours. 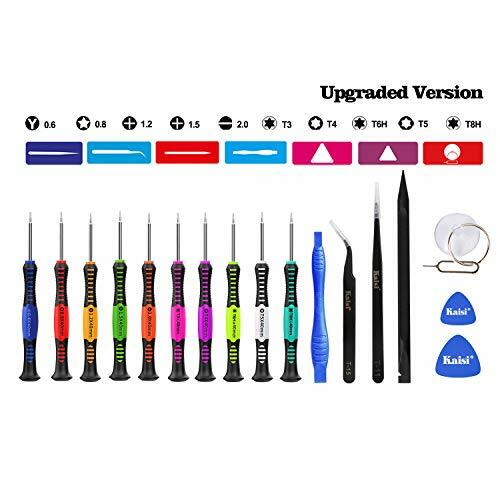 Wide Application GANGZHIBAO 90 in 1 precision screwdriver set is a professional repair tools kit for iPhone, iPad, MacBook, Cell Phone, PC, Computer, Laptop, Tablet, Camera, Game Consoles, PS4/Xbox Controller, Watches, Glasses and other electronics. 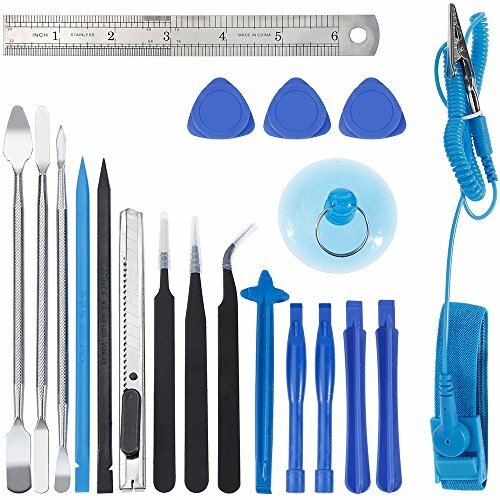 Whatever you are a professional or amateur in the IT world, you can easily use this electronics tool kit to repair phones, computers and laptops. This helpful repair kit is also as a cool and decent gift for your friends, father, husband, son, etc. Multi-functional Tool Set This versatile electronics repair kit has 56 different screwdriver bits (Y0.6, star 0.8 screwdriver bit for iPhone 4/5/6/7plus/8/SE/X/XS), solid and flexible shaft, 1/4 inch screwdriver adapter, anti-static wrist strap, complete pry tools set, ESD tweezers, magnetizer, etc. 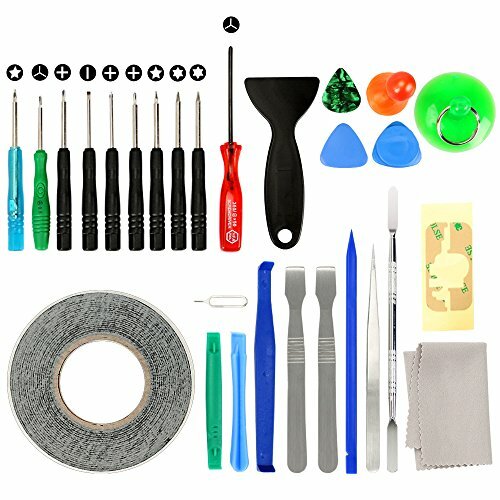 With this useful and full repair tool kit, you can fix everything from phone to electronic, such as replacing the iPhone screen, battery or repairing laptop by yourself to protect privacy. High Quality Helper Magnetic Screwdriver Bits are made of quality stainless steel - S2, whose hardness is up to 60HRC. All of standard size bit undergo the rigorous quality control testing, the tip is stable and not easily stripped. Anti-slip Metal Spudgers are made of sturdy stainless steel, and its toughness is stronger than ordinary alloy pry tool. ESD Tweezers are made of durable stainless steel. It has strong corrosion resistance and its tip is not easy to strip and deform. 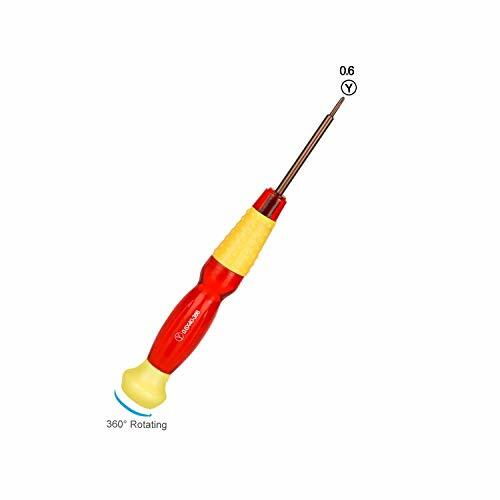 Humanized The non-slip screwdriver driver handle designed a special hole to increase power, you can use it stably and efficiently. You don't have to worry about the screwdriver become no magnetic, because the magnetizer keeps it strong magnetically. You will be happy to find that the anti-static wrist straps and ESD tweezers can prevent electronic components from static damage. The size of the portable oxford bag is equivalent to the size of 2 iPhone 6 and you can carry it easily. 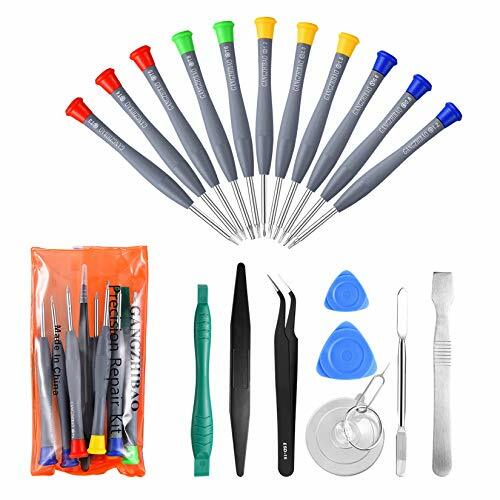 Precision screwdriver set with offset tweezers can be used for a variety of projects from hobbies, automotive work, watch repair watches, mobile phones, televisions, PDA and PC. Easy to carry and store at home and work. Help to open the mobile phones cover easily without damaging it. It has everything accessible for face-plate change. Screw driver with STRONG magnetic tips and anti slip handle. Material: Steel + plastic(Stainless steel tip, plastic handle with rubberized grip). Warranty: All Floureon repair tools have 1 year warranty, 100% satisfaction and zero hassle returns guaranteed. Convenient: Easy to carry and store at home and work. Screw driver with STRONG magnetic tips and anti slip. Material: Stainless steel tip, plastic handle with rubberized grip. 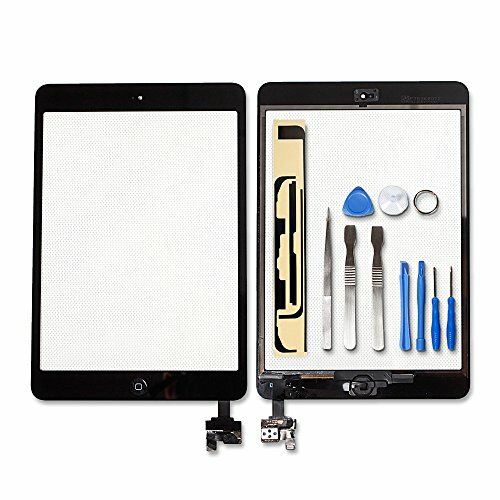 Safety: Allow to take apart mobile devices without damaging the tablet or phone cover. 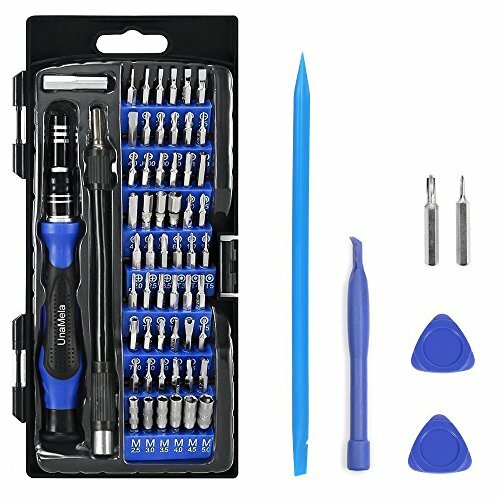 If you're looking for a small toolkit and you plan on doing a lot of electronics maintenance, UnaMela screwdriver set is a seriously consider. 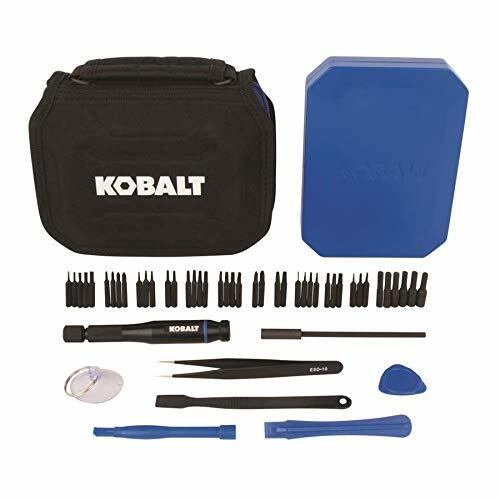 Driver kit include all current common and specialty bits, More accessories,egs for Magnetizing and demagnetizing tool , anti-slip antistatic tools, makes repairing work more easily and safer. Electronics: Computer, Macbook ,phones, PS4/Xbox ,iPad ,iPhone, Tablets, Laptops, Watches, Glasses, Camera , Electronic Cigarette ,Toys. Multi-functional Combination: The 56 magnetic bits are selected carefully by UnaMela professional team who is accroding to thousands of Maintenance instructions,which is suitable for most of the screws in the market,to meet all your demand.Update 2 bits(Y0.6 and Mainboard size 1.5) for repairing iPod/Iphone8/8 Plus/SE /7/7 Plus / 6/6 Plus/6s/ 6s Plus.The flexible shaft can be bent freely for the screw in the hard-to-reach area, which is really suitable for the screw not on the surface. High Quality:56 magnetic bits are made of CR-V steel,which is hard,strong,durable and not easy to rust,the hardness reached more than HRC52.The flexible shaft is made of high-quality plasticically material which has high toughness and flexibility and ensures long-term use.The tweezers are made of high quality stainless steel which can prevent corrosion from the corrosive agents.The handle is ergonomically designed and has an anti-slip function which makes work easier and more comfortable. Multi-tool Set:80 in 1 screwdriver set has 56 different types of bits,Magnetizing and demagnetizing tool,Anti-Static Wrist Strap,Anti-Static tweezers,spudgers,plectrum, utility knife and other Utilities.The spudgers is sharpened one side and easy to embed in the gap which easily opens the cables and other Components.Triangle plectrums are used for opening the screens.Scraper is used for screen protection film.The round and cross spudgers are lever principle desgined,which is labor-saving. Anti-static Wrist Strap and Magnetizer: The tech toolkit has an anti-static wrist strap to protect your electronic equipment, freeing you from static electricity and making your repair work easier and safer. There is also a magnetizer, which allows you to adjust the magnetism of screwdriver bit, solving the problem of insufficient magnetism or too much magnetism. 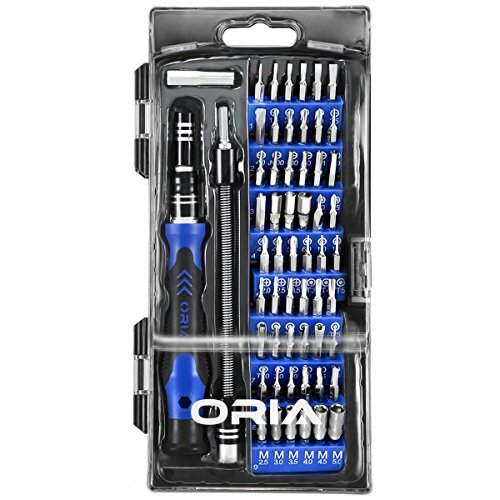 Lightweight and Compact Package: The bag of the screwdriver set is made of high quality oxford cloth. 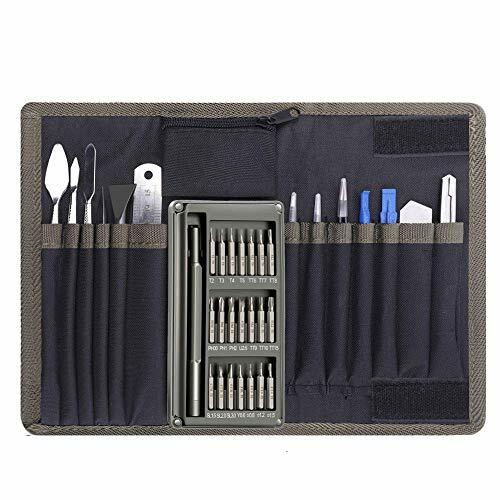 The accessories of the tool are Organized ,which is convenient to carry everywhere you want.The electronic tools kit is designed for PS4,iphone,computer,laptop,MacBook, glasses,electronic cigarette,and other electronic devices.The screwdriver kit is also a wonderful gift for your family and friends. This is a complete tool kit for IPhone 4/4s/5/5s/6/7, Android smartphones, Ipad, laptop,Macbook and other electronic repair devices, cleaning. Material: Steel and plastic, 100% new and of good quality, they are resistant and durable for prolonged use. LIFEGOO is a fast growing brand. We are dedicated to providing high quality products and satisfying our customers. If there was any problem with your repair tool kit for phone ihone, you can easy to reach customer service to solve all your problem in 24 hours. 1. 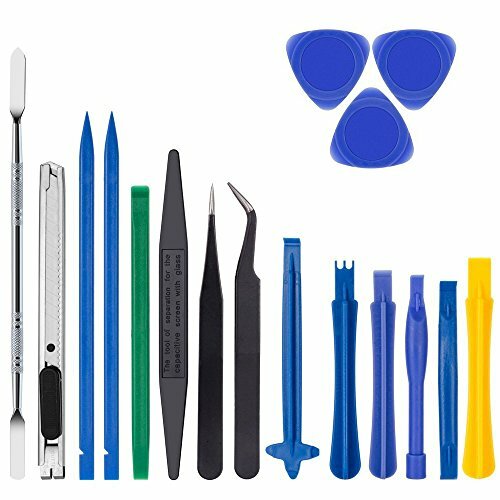 Repair Phone Kit Phone repair replacement tool kit specially designed for repairs of all kinds of mobile devices, like your iPhone 4, 4s, 5, 5s, 6, 6 Plus 8 8plus,7& Samsung S3, S4, S5, S6, S7, Note Nokia, HTC, Sony, Motorola Huawei, etc. 5. Efficient Service We are dedicated to providing high quality products and satisfying our customers.If there was any problem with your iphone repair screwdriver removals cleaning tool kit,feel free to contact us any time.We will solve your problem within 24h. 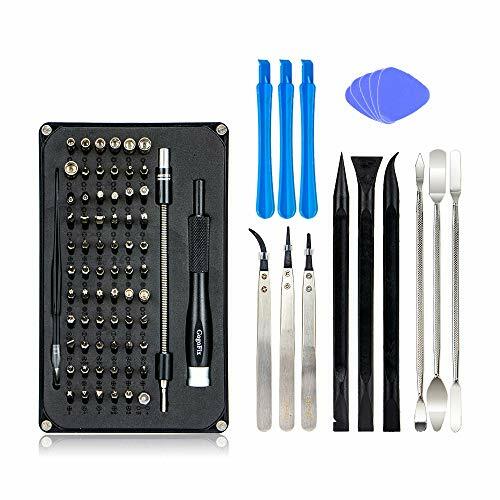 Professional tools 56 bit driver kit multi-type precision driver bits & CRV sockets meet various purpose and application for repairing, such as Macbook, cell phone,PC,electronic cigarette,game console.2 Special Bits (Y0.6 and CRV 2.5) for iPhone 8 8 plus tail and internal screws. Anti-Silp handle: The handle with a ball bearing mounted swivel top,comforms to ergonomics design and has an anti-slip function to make work more easily. The Driver Adapter allows your electric screw machine to be connected with 56 magnetic bits. Various Openers:The spudgers is sharpened one side and easy to embed in the gap which easily opens the cables and other components.The other end can also be used as a flat-headed screwdriver to make your work efficiency.The kit has 2 triangle plectrums, all three corners can be used for opening the screen .The round spudgers is lever principle desgined,which is labor-saving.These tools are widely used in repairing smartphones,laptops,computers and other electrical appliances work. High Quailty and Portable Repair Tools All bits are made of supreme chrome-vanadium steel, and specifically heat-treated .The flexible extension is made of high plastically material, which has elasticity and not easy to be broken.The pudgersand triangle plectrums are excellent in strength and toughness which are not easy to break and are durable.The tool kit with perfect weight and compact is designed for convenient carry. 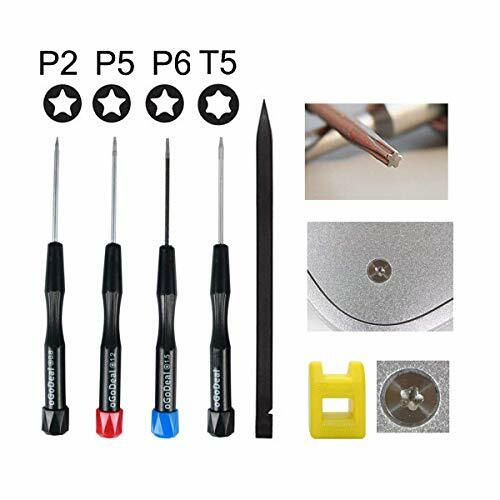  FUJIWARA screwdrivers is suitable for precision electronic equipment repairing: Smartphones, TV, Laptop, Watch, Glasses and other digital products.  These screwdriver kits are collected by a durable magnetic plastic box so tight with perfect weight easy to carry and against losing.  We have full confidence in our screwdrivers which provide 30 days money back and we always make high quality products for our customers. 2 x Triangle Paddle Warranty: Kaisi offers 2-years worry-free warranty, 90-days free refund and replacement. *Get all the tools you need to disassemble, repair and reassemble your electronic devices with these advanced tool kit. Easy repair your devices in minutes. *Keep these essential tools today, so you'll always be ready if your electronic devices or gadgets go down. *Petty nice to have one at home or office. It s also a good gift to your family or friends. *ESD safe, Nylon tips are sturdy and great for working with delicate electronics. It's like having spudger-chopsticks. Nylon tip is replaceable. Complete and frequently used bits for all disassemble, repair and reassemble your electronic devices with these advanced tool kit. Easy repair your devices in minutes. Magnetic Bits: Made of S2 steel materials (HRC58-62) which is hardness and durable. ; Lightly magnetized bits improve handling of tiny electronics screws. -Quality: Sturdy precision driver with anti-skid handhold. Metal y 000 tri head screwdriver for iphone 7,iphone 7 Plus,iphone 8,iphone 8 Plus,iphone X Apple Watch Series 1 and 2. Applied to tighten or loosen the 0.6 Y-type screws. Designed to open the screws securing the display cable bracket and battery connector bracket,also open Tri wing screws on home button bracket. 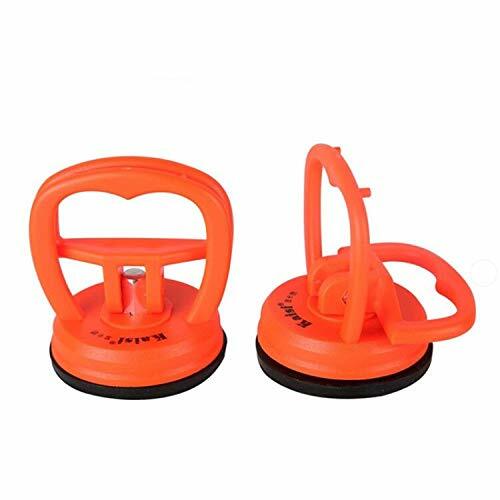 Labor-saving spinning top, fixed driver makes frequent repairs much easier. 1 x Y 0.6mm Tri-wing Screwdriver Disassembling Tool for iPhone 7 7 Plus 8 8 Plus X Apple Watch. 2. Long press NS power button, pop-up menu select "power option", click "turn off", Turn NS off completely. 3. Put the relevant system files into the TF card root directory. 4. Insert the short connector into the right hand handle slot. 5. Press and hold the NS "volume button +", do not let go. 7. The short is successful, at this time NS is in "RCM bootable mode". At this time, you can use computers, Android phones, dongle, etc. 8. Connect the data Cable at the bottom of the NS and inject the boot program through the data Cable. 1. The short connector does not need to be inserted into the bottom! 2. This item does not need to be inserted heavily into the bottom, you could stop to insert when you feel the resistance from machine. Note: This item does not need to be inserted heavily into the bottom, you could stop to insert when you feel the resistance from machine.